Indian Navy Tradesman Mate Admit Card 2019 for Indian Navy Civilian Entrance Test (INCET) 2019 has been released and is now currently available for download. The admit card was released on 2nd April 2019 and will remain available for download till 14th April 2019. The exam is also scheduled to be conducted on 14th April 2019. Indian Navy invited applications for the recruitment of 554 posts of tradesman mates. A number of candidates applied for the post. These applicants have to appear for the online selection test. Without a valid admit card no candidate will be allowed to appear for the selection test. Candidates should download and print the admit card before the last date. As during the last days, they may face number of issues such as overload on site, slow processing, and various technical & non-technical issues. Therefore, they are advised not to wait for last date and to get it printed on time. Latest Updates 11/04/2019: We have just uploaded list of examination center code address here. Download the complete list from below link. 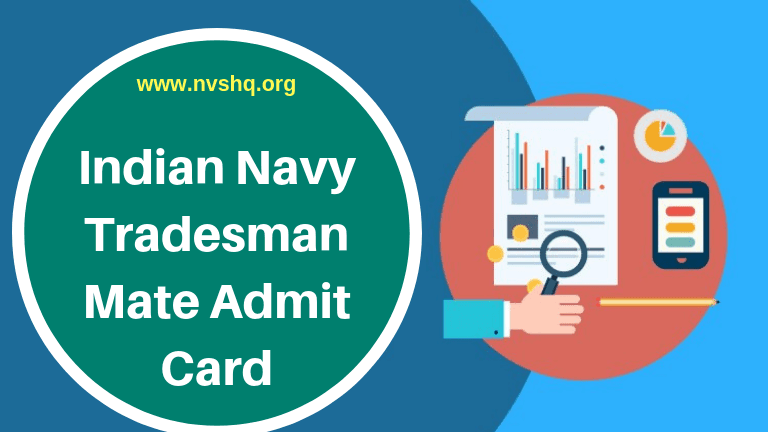 Candidates can find all the details related to Indian Navy Tradesman Admit card 2019 in this article. Admit card is currently available on official link provided by the conducting authority. Candidates who haven’t downloaded their admit card yet should download it on time. They should not wait for last date as they may face various issues at the last moment. So they just need to hurry up and get downloaded the admit card on time. Visit the admit card download link shared below. Enter the registration Id and password or date of birth on the login page. Enter the captcha code and click on “Login” button. Check the details mentioned on admit card. Download and take multiple printouts of the admit card can keep it safe till the day of exam. Candidates should check all the details mentioned on the admit card before appearing for the exam. Candidates should ensure that the name appearing in the admit card (provided at the time of online address) is matching with the name in the photo ID proof. A printed copy of valid INCET 2019 admit card. Any of the following Photo Id proof in original- PAN Card/ Aadhar card with a photograph / Passport/ Voter’s Card/ Driving Licence/ Bank Passbook with Photograph. They should note that Ration card and Learners Driving License will not be considered valid id proof. Apart from aforesaid documents no other document, piece of paper is allowed to be carried to the exam hall. INCET 2019 admit card can be downloaded before the closure date i.e. 14th April 2019. No printed copy of the admit card will be send to any candidate by post. Candidates must download their admit card before the closure date. Admit card can be downloaded by providing registration number and password/DOB. It is mandatory for all the candidates to produce valid admit card and photo ID card at the exam center to invigilators for verification. Candidate should reach the exam venue before the reporting time mentioned on the admit. They should strictly follow all the instructions given on the admit card. In case of any query or assistance related to Indian Navy admit card candidates can contact at 1800-419-2929 and email to [email protected] between 8:00 am to 8:00 pm. Sir, where could we have the uploaded pdf format to find the correct location of the examination centre. pls support. yes, humne address ki pdf file upload ker di h. Please check it. in the admit card , examination center address not given … there is given only examination center code – 141. We have uploaded address list pdf file. Please download it and check your examination center. FULL ADDRESS ARE NOT SEND TO ADMIT CARD SO HOW WE FIND IT? We have uploaded full address in our article, Please download it and refer to your center code full address. MY ADRESS CODE PLEASE SENT MY GMAIL.MY EXAM DATE 13/04/2019.ANY RESPONSE PLEASE SENT MY [email protected]. REGNO.-19010072598.INDIAN CIVILIAN ENTRANCE TEST [INCET-TMM-01/2019]R.PLEASE RESPONSE MY MAIL.THANK YOU SIR. It will be available soon. Please wait. They have mention only center code…address not montion. Humne ek pdf file upload ki h. Use download kariye aur fir apne center code ka full address pata kariye. Contact the exam authority as soon as possible.